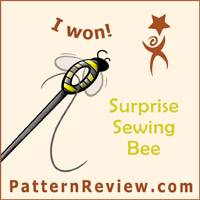 Over on Pattern Review there was a sew-along for people enrolled in the Sew Better, Sew Faster, Garment Industry Secrets Craftsy Class by Janet Pray. In the class Janet takes you through the construction of her Jacket Express pattern, while teaching you industry techniques to improve and speed up your sewing skills. We learned things like pinless sewing, burrito technique for yokes and cuffs, topstitching and cutting tips. The class was well worth my time and money because I’m finding that I’m automatically using these techniques in my sewing without thinking about it, and yes, I’m sewing faster! I used a grey linen for my jacket. I only had 2 yards so I made a collarless version, still keeping the same linen for the facings, yoke and pockets. I could have switched things up with another fabric but I wanted a clean, simple look. To make it collarless I just copied the shape of the neckline to make a facing (a technique I learned in another Craftsy class: Underneath It All with Linda Lee). Then I attached that facing piece to the front facing and I was good to go with the rest of the instructions. You do have to be exact with the measurements around that curve for a nice, clean look. I really loved doing the topstitching! I used two threads through one needle of a light grey poly thread. I admit a good part of my success was from using a topstitch needle from Superior Threads – what a nice needle – and my old Bernina 1230, which makes such a beautiful stitch. I adjusted the fit by taking in the waist a small amount, and I expanded the hip area as much as the side seam allowances would allow, then adjusted the facing the same amount. The upper back looks a bit baggy, but that room is nice when I put the jacket on over something thicker or when I need some extra movement room. Recently Craftsy put up another Janet Pray jacket construction class, The Motor City Express in Sew Better, Sew Smarter, Smart Construction. I nabbed that one when it was on sale for $19.99, and I’m looking forward to making it soon. This entry was posted on Friday, March 13th, 2015 at 12:55 pm	and is filed under Sewing. You can follow any comments to this entry through the RSS 2.0 feed. You can leave a comment, or trackback from your own site. I love your jacket and am in awe of the fit. It’s really great! I am pleased with mine as well, but the jacket is far too big in the sleeves, cuffs and back. I will make it again, and use a more durable fabric, and work out the fitting issues. Would you like me to link to you blog or PR when I write my blog re: this class? So, would you have a problem with obama claiming he is African American? He’s giving no credit to being half black with that deiiangtson either. Right? So, he could be accused of being ashamed of his white half by your own argument. Quite true Morgan, the interface is the cleanest and crispest by far. Competitors take note.One thing though, I do have trouble getting more detailed info about the domain “Views” on the Portfolio dashboard.My in the next incarnation.JTW. wud like to make a small correction Sorgamey endrallum athu namma VOOTA pola varuma..:)btw..like ur narration of nature and how its supposed to be enjoyed.. If they just hand the info over, is it really insider info? Or is it yet another piece of propaganda for the media campaign? When you do your job and hunt for info you might find something interesting they didn't want you to find. Real, shocking exclusives instead of the fake, tame ones. Woman of Alien…Excellent get the job done you have got done, this web site is de facto awesome with fantastic information and facts. Time is God’s way of maintaining every thing from taking place without delay…. Hey Zach, I have put in my application. Though I admit I forgot to send you my pic, I can do that later, Just remembered sorry. Hope to hear from you soon. The Ships’s Voa2;es&#8y30gI believe engineering just makes it worse. Now there is a channel to in no way treatment, now there will not likely be a chance for them to find out…. You look fantastic as always. And that top stitching! Look forward to seeing this in person! That looks fantastic! Better than RTW because it is PERFECTION. I have watched that class 2x and have an Elna Press (that I love) as a result. But I have not made the jacket…yet…it is on my list for this year!